Kaivac’s Cooler Case Cleaner offers a simple, effective solution for maintaining refrigerated display cases. With a specially designed, built-in indoor pressure washer and a powerful wet vacuum, the results are clean, safe and odor free coolers operating at peak efficiency. Plus, it takes less than half the time of conventional cleaning methods. Why is this important? Because a clean refrigeration unit is critical for optimum performance, and to ensure food safety and quality. Dirty or clogged evaporator coils are a leading cause of refrigeration inefficiency or even failure. Compromised food quality and safety can result in wasted food products and lost sales dollars — or worse. In addition, if not cleaned properly and frequently, the shelving and areas behind them can harbor potentially dangerous contaminants, creating a very high risk of biological contamination. The operator quickly flushes all dirt, debris and organic contaminants from the evaporator coils and fan units using the built-in indoor pressure washer. Unlike traditional pressure washers which can damage sensitive components, the Kaivac system provides the perfect balance of water pressure and volume for effective results without harming expensive equipment. 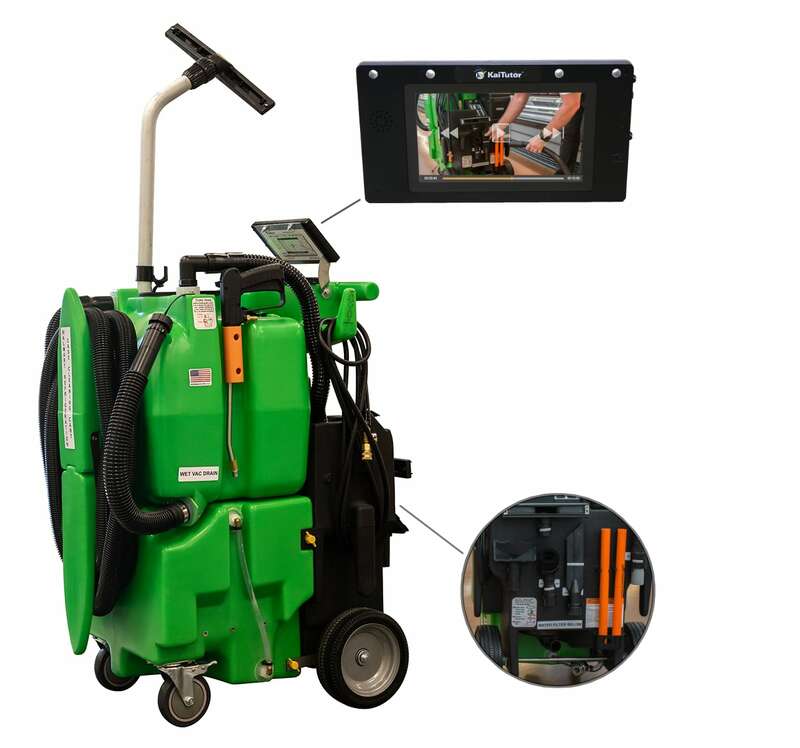 The liquid, soil and other matter is efficiently removed by the system’s three-stage wet vacuum.The Cooler Case Cleaner includes a machine-mounted KaiTutor video training system to lead the operator through the cleaning process. Clean coils extend the lifespan of refrigerated display cases. Clean coils improve energy efficiency by 35% or more. Proper case temperature and cleanliness reduce product spoilage and waste while protecting customers from food-borne illness. If not cleaned properly or with sufficient frequency, the shelving and areas behind them can harbor potentially dangerous contaminants. This creates a very high risk of biological contamination and food-borne illness, which increases with reduced cooler performance. Sanitary appearance and conditions increase customer satisfaction and purchases. Proper cleaning of refrigerated display cases eliminates a primary cause of unnecessary and costly service charges. Reduce cleaning times compared to other methods by 50% or more. Can be used in multiple areas, such as dairy, café, produce, onions, potatoes and more. The system is very simple and easy to use. It also includes Kaivac’s patented KaiTutor onboard video training system as well as printed placards. Improved productivity, longer cooler lifespan, increased energy efficiency, reduced spoilage, fewer service calls, and greater customer satisfaction add up to a very rapid return on investment. to extract heavy soils and unclog cooler drains. Connects to multiple tools for difficult and tight areas. holds 17 gallons of soiled water in upper tank. Easy-access port makes for simple clean out as well as quick dumping of soiled water to floor sink by using the dump hose. holds nearly 20 gallons of hot water. Fill the tank with the attached multi-faucet fill hose or easy-access fill port. a sturdy, one-piece wand made of aircraft aluminum for cleaning multi-surface floors. allow employee to prop fans up while cleaning fins. provide spray pressure that is dialed down to be delicate enough to use on fins but powerful enough to clean heavily-soiled areas. allows the user to cover extensive areas as needed by unwrapping length of power cord as needed. a machine-mounted training system to lead the operator through the cleaning process. provides powerful & convenient cordless cleaning.